It's not often that you get the chance to spend time in the presence of true pop music royalty but yesterday (Thursday 16th December) was one of those days; I had the good fortune to spend several hours with Motown legend Martha Reeves. Often referred to as the Queen of Motown, Martha's gospel roots helped set her apart from the label's other female leads. She's known around the world for hits including Jimmy Mack, (Love Is Like A) Heat Wave and Nowhere To Run, but she's perhaps best known for Dancing In The Street, one of Motown's most famous tracks (and that's really saying something). A few weeks ago I learned that Martha was embarking on a short UK tour including several nights at London's Jazz Cafe. A keen Motown fan, I immediately requested an interview. Initially I was told that Martha would only be available by telephone - that was fine by me. How many people even get the chance to speak to music royalty on the phone? But on Wednesday morning I got an email to say that Martha had decided to meet me in person instead. I'm not sure what made Martha decide to meet me after all - I forgot to ask her - but I'm glad she did. It was a last minute affair, arranged with less than 24 hours' notice, but the experience was one I will never forget. Generous with her time and her answers, Martha spoke to me over lunch for roughly one and a half hours. Our discussion encompassed subjects including - but not limited to - the increasing sexualisation of female musicians, why a computer will never create better music than a live band, her former drug dependency and subsequent Christian rebirth, the corruption she witnessed while serving on Detroit City Council and her plans to return to her gospel roots. Upon learning that I didn't have a ticket to her sold out show at the Jazz Cafe, Martha insisted that I meet her back at her hotel later on so we could travel together to the gig and she could bring me in for free. Arriving early on with Martha and her entourage allowed me to secure the best spot on the lower level - front row and centre. From there I watched Martha, backed by her Vandellas and a tight band (led by Al McKenzie, Martha's musical director of 30+ years), deliver an energetic 90 minute set comprising some of her biggest hits, a few lesser known classics like Third Finger, Left Hand, and an array of tributes to artists including Marvin Gaye (What's Going On), Billie Holliday (God Bless The Child) and James Brown (I Got The Feelin'). Halfway through her set, Martha surprised me by name-checking me from the stage. "I want to dedicate this next song to Charles. He's a young, up-and-coming writer - he's right here in the front," she said, gesturing towards me, "and he's never seen our show before. He's all of twenty-something years old, I think." Then she launched into a rendition of A Love Like Yours (Don't Come Knocking Everyday). It was a strange moment, feeling everybody's eyes on me, but one I will never forget. It's not every day that a music icon dedicates a performance to you. Martha captivated the audience - a much younger crowd than I had anticipated. Her voice has aged and she sings in a higher register than she used to, but her performance was brimming with energy. New material such as Home To You suited her voice perfectly. 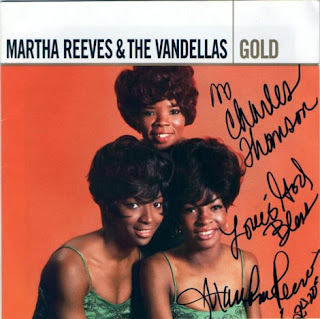 The show built to a crescendo when Martha fused her hit Dancing In The Street with tracks from other Motown artists like the Four Tops and Stevie Wonder. The audience went wild. A great ending to a great day - made possible by a great woman. NB. 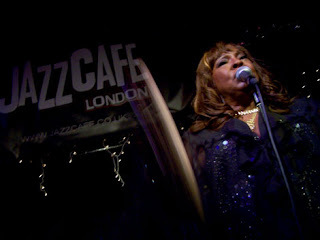 My exclusive, in-depth interview with Martha Reeves will be published in January 2011.